Abstract: In order to foster active Large-Scale Social Requirements Engineering (LASSRE), it is not enough to provide services for requirements elicitation and negotiation only (e.g. Requirements Bazaar). We need to motivate people for active participation in LASSRE process. To foster user motivation for participation, the Requirements Bazaar is designed in an enjoyable and intuitive way. However, further motivation forces for active user participation are still required. In this short paper, we describe our approach for LASSRE support in the form of an open-source navigation dashboard. Our investigations on psychology of community and collaborative work guide us to the concept of awareness. Hereby, we consider requirements elicitation and negotiation processes in communities as instances of knowledge sharing. “To know what is going on” within a project community provides its members with a global view on their activities. Moreover, it also makes people aware of what impact their activities have on community life. Shared perceptional models help project participants to better understand the requirements of their community as a whole. In addition, it provides people with a feeling of belonging and shared faith. Information sharing encourages user participation, whereas shared understanding of community needs is argued to result in a better attitude towards the developed information system. Consequently, visualization and reflection of the LASSRE process should be a strong motivating force for active end-user participation. From individual perspective, reflection of our own achievements and a wish to improve our status within the project community drive us up. Hereby, intuitiveness of data representation format plays an important role. To support awareness within the project communities about LASSRE processes, we designed a visualization concept called Navigation for Open-Source Software Evolution (NOSE) dashboard . The original goal of the NOSE dashboard was to provide community-oriented navigation support for OSS project members. NOSE was designed to visualize collaboration processes within OSS communities and to uncover problems and conflicts. Each widget of the NOSE dahboard reflects one statistical measure based on the community data. The NOSE concept was developed in context of the longitudinal study of community-oriented software development in three bioinformatic OSS communities. The evaluation showed a strong interest of OSS developers in visualization of community statistics. Especially, the network graph visualization of the communities was recognized as the most interesting metric. The developers were more interested in aggregated statistics in order to avoid the feeling of being observed among the project participants. Figure 1 displays an example of the NOSE platform which contains three widgets reflecting progress at Requirement Bazaar. Each widget provides visualization of one statistical parameter of the project as a community. The first widget on the left-hand side shows a pie chart, which reflects activity of each participant. The second widget (on the right-hand side) displays a user network, whereas the users are connected within the network, if they have commented on the same requirement in the Requirements Bazaar. The last widget on the bottom presents community interest in each defined requirement. A user has an ability to personalize the dashboard according to his/her personal preferences by selecting widgets of interest provided in ROLE space NOSE. The menu on the left-hand side in Figure 1 displays a list of the realized widgets. A user is free to select and to remove widgets from his/her personal space. To reflect project life from different points of view, analysis of participants’ progress is not restricted to the Requirements Bazaar only. Currently, multifold analyses of Requirements Bazaar data is combined with the analyses of MediaWiki data. Reflection of different social media used in a project helps participants to construct more precise concept model of the project. However, different data sources bring new challenges for our analysis. We have to deal with different data formats. In addition, we have to resolve the aliasing problem. 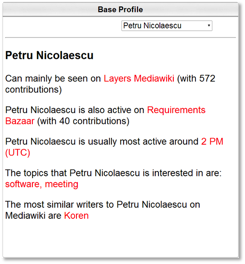 Figure 2 presents a screenshot of the NOSE widgets, which display the results of MediaWiki and Requirements Bazaar data analysis. Currently, we are in the process of extending our analysis palette by text mining analysis. The goal of this extension is to identify areas where users struggle. Figure 3 presents an example of the widget, which reflects an automatically established profile of a selected individual. A user who navigates the NOSE dashboard has a possibility to select any person known to the system in the dropdown menu at the top of the widget. For the selected person the logic behind the widget calculates his/her activity level in different project media, activity time, and his/her most often collaborator. Besides, by means of text mining methods applied to the postings of the corresponding person, his/her topics of interest are automatically extracted. A. Hannemann, K. Liiva, and R. Klamma, “Navigation Support in Evolving Open-Source Communities by a Web-Based Dashboard” in IFIP Advances in Information and Communication Technology “Open Source Software: Mobile Open Source Technologies”, vol. 427, pp. 11-20, 2014. Anna Hannemann (nèe Glukhova) is a PhD student and a member of the Advanced Community Information Systems (ACIS) group at the Chair of Computer Science 5 (Databases and Information Systems), RWTH Aachen University, Germany. She received her diploma degree in computer science in June 2007 from RWTH Aachen University. Her research interests are social network analysis, process mining, data mining, innovative requirements engineering techniques as well as computational biology and neuroscience.